Ever since Star Trek Enterprise went off the air, there has been a void, a lack of new Star Trek TV or movies available to fans. 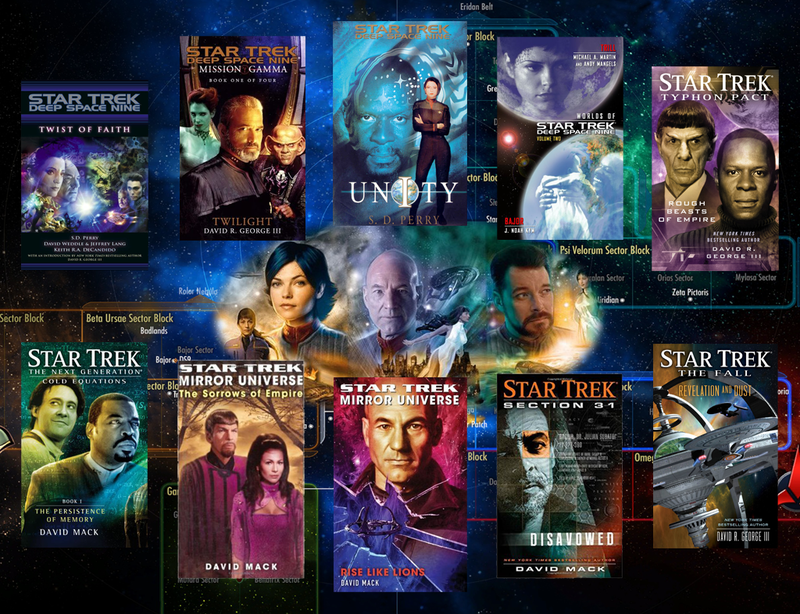 The NuTrek films (the 2009 Star Trek reboot and subsequent movies set in an alternate universe) do not count, because although they are great action movies and bring attention and popularity to the series, they lack the philosophical core and spirit of exploration that are the very defining principles of Star Trek. Fortunately, a group of enterprising writers has been filling this void with a collection of books, all of which are coordinated together to share the same storyline in the post-Nemesis universe. The Star Trek Lit Verse picks up where each series left off, or fills in background information about prior events. Thus, each series is "relaunched" to bold new adventures. Although the books share a consistent storyline, it can be challenging to navigate all of the crossovers and parallel events to determine the best order to read them. Fortunately, fans have create this guide for determining how to read the new books. Below are some examples of how well these works enhance the Star Trek universe. Each TV series has a set of relaunch books. Most interesting to me is the DS9 relaunch, which explores what happened to Benjamin Sisko and the continuing events on DS9 after he left. This includes Kira's promotion to Captain, Bajor joining the Federation, and even a Jem'Hadar observer (sent by Odo). Perhaps the most intruiging facet of the DS9 relaunch is Elias Vaughn. Aside from Jean-Luc Picard, Elias Vaughn is my favorite Star Trek character. A lifelong Starfleet Intelligence operative who has always dreamed of exploration, Vaughn is reborn and reinvigorated by an orb experience that drives him to pursue his lifelong quest to explore. This pursuit is inaugurated by a 3-month mission to the Gamma Quadrant, where the Defiant meets many new civilizations and saves the Vahni Vahltupani from destruction. Vaughn's relationship with Prynn Tenmei, his enstranged daughter, provides an insight into the pain he feels as a failed father. His love for Prynn is expressed beautifully during their shared mission to Harkorum, where Vaughn is willing to do whatever it takes to save his daughter ("Run, baby"). Vaughn (aka Eli Underwood) also shared an orb experience with Benny Russell in the Celestial Temple, where he plays a crucial role in altering Sisko's life. This firmly establishes the close bond that Vaughn and Sisko share; a bond that surpasses words. Sisko faces some great challenges that test the very limits of his resolve, and in a full-circle moment, he tells Kira the story of the 3 brothers who were kava farmers (the same story she told to Sisko when he was injured in Starship Down). "How did you get here, Elias?" she asked, her voice barely audible over the sound of the atmosphere rushing out. The newly reinvigorated Vaughn said nothing, but in reply, he stood up, reached forward, and hauled Kira up into his arms. For a moment, she thought, he meant to leave the ship and carry her through space to safety, but that seemed a mad idyll. Instead, he bent his legs, spun his body, and threw her into the air. This is a powerful image, particularly in the context of the larger story. Ro Laren also returns to play an important role on DS9, where she learns true forgiveness and kindness from Jean-Luc Picard, who recommends her for a Starfleet commission, despite her betrayal of him years earlier. Picard recognizes the growth she has experienced, both as an officer (in the Bajoran Militia) and as a person, and her desire for a fresh start. The TNG relaunch explores the fall-out from the events of Nemesis as well as the events following Star Trek Destiny. My favorite aspect of the TNG relaunch is the Cold Equations trilogy, which provides a touching and thought-provoking look into Dr. Noonien Soong's quest for immortality and the love he has for his sons. It also explores the presence of other artificial intelligences in the galaxy and how they may differ from the most familiar AI, the late Data. The Star Trek Destiny trilogy provides a fascinating look at the Borg's past as well as the introduction of a new, powerful species, the Caliaer. The Caliaer gestalt is a remarkable concept and an interesting contrast to the Great Link. This trilogy also dramatically ties together stories from the ENT, TNG, and DS9 eras. See this post for my detailed thoughts on Destiny. The Typhon Pact provides a captivating look into several non-Federation species. The Tzekenthi in particular are very intruiging, with their beautiful glowing skin, their rigid genetics-based class system (all in service of the Autarch), and the way that they use all walls of a room (the superior and inferior floors) rather than just the bottom one. We learn much more about the Breen, and their sacrifice of individuality for the sake of uniform treatment of the Confederacy's many species (all must wear the same suit to disguise their species). The Typhon Pact series also delves into Romulan society after the schism Shinzon caused. In particular, Gel Kamemor is a truly fascinating character; a stark contrast to most of the Romulans portrayed in the TV Series. This also continues Spock's quest for Reunification, with some interesting twists. The Fall cements Bajor's role as a Federation powerhouse. Events dramatically alter the new, fledgling Cardassian Union, during which Garak plays a pivotal role. The mirror universe arc, begun in TOS's "Mirror, Mirror", continued through several episodes in DS9 and ENT, explores a parallel universe where Earth conquered races they encountered to form the Terran Empire, a vastly different politicial entity from the Federation. The mirror universe books, including The Sorrows of Empire, Rise Like Lions, and Disavowed, expand on our view of this universe to see it as not just an evil reflection of the prime universe, but something much more complex. Here we see familiar characters striving for the same bright future as their counterparts, but living in a drastically different set of circumstances (e.g the Klingon-Cardassian alliance). It is very interesting how many of the same people exist, and end up in the same place (e.g Miles "Smiley" O'Brien on Terok Nor). Moreover, in The Soul Key (part of the DS9 relaunch books), the Prophets are shown to exist in a multitude of parallel universes, and in each they call Benjamin Sisko to be their emissary, despite the events in said universe (e.g in one he was a Borg drone). This fact coupled with the continued parallels in the mirror universe lead me to believe there's something akin to quantum entanglement across parallel universes, which causes events to synchronize between them. This would explain why the same people exist in both universes and why they end up in the same place or with similar interests or professions despite drastically different circumstances. This sort of cross-universe interaction is supported on some level in modern science by Brane theory, which postulates that gravity from one brane can propagate to other branes. Furthermore, the concept of Memory Omega, and the grand plan that the Mirror universe's Spock envisioned and Saavik helps to execute is a refreshing and intriguing alternative to the Federation we know. In many ways I find the outcome of Rise Like Lions more intriguing than events in the prime universe.